Price: Rs. 299 on Amazon. The first and second books in this series were so awesome, that I picked this one as soon as I was done with the second. 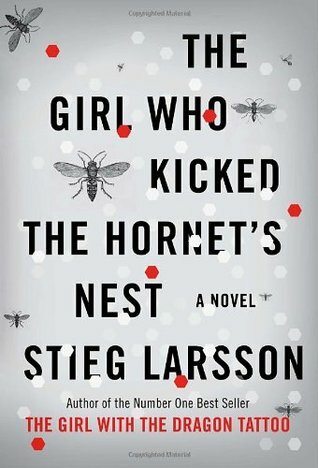 While the original translation of the Swedish book is called The Air Castle That Exploded, The Girl Who Kicked The Hornet's Nest is a continuation of the second book and manages to tie all ends together. In this book, the characters have more interesting lives. While Salander is now confined to an intensive care ward due to her injuries, she is also assigned a lawyer (Blomkvist's sister) to fight the murder case where she is the prime suspect. Blomkvist is going out of his way to help Salander, including smuggling a PDA and a modem into the hospital for her to use. Erika Berger is going to quit Millennium to be editor-in-chief at Sweden's largest daily paper. As soon as she takes over, she begins receiving graphic e-mails and threats from an anonymous source within the new company. Zala is admitted two rooms away from Salander in the same hospital and she still fears that he might kill her. The Section is going out of their way to institutionalize Lisbeth and declare her mentally incompetent. Soon, Zala is murdered and Salander's life is put in danger too. Annika Giannini, Blomkvist's sister and Salander's lawyer, saves her life. The highly classified Sapo file that contains the identity of Zala and the names of all the high ranking police officials who helped him into the country goes missing from all the people who had it. Blomkvist realizes that the phones and homes of all the Millennium employees are bugged and he begins to investigate the Section in earnest for a Millennium expose. Lisbeth Salander's case soon begins and she is exposed to a lot of questions about her past. Yet, she remains who she is. The plot doesn't move away from the case much, even though it occasionally toggles between Blomkvist and Berger's lives. The ending couldn't have been any better and that my friends, is what we call closure. The second book made me fall in love with Lisbeth Salander and this one restored my faith in her. I did not want her to become someone else once the "evil" was behind her. I could never imagine her as miss goody two shoes. She's what she is and is unapologetic about it. That is what makes her the most intriguing protagonist I've ever come across. The political angle is well described and takes its time to unfold. There is no mystery in this book, all of that was revealed in the second one. This book forms the perfect conclusion. Since the book has a limited number of characters, it is easy to follow their lives closely. You want to know what happens to each character and how the story culminates. And it did, in the most beautiful way possible. Camilla Salander, Lisbeth's twin sister was mentioned more than once in the novel. I expected her to show up. Later, I expected her to be an alter ego of Lisbeth. The perfect woman to the "I don't give a damn" Lisbeth". I kept wondering why there was not much of her. But as the stories progress you realize that it is all about Lisbeth and her struggles. Trying to merge Camilla in the story would have crowded it and taken some exposure away from the awesome female protagonist, Lisbeth Salander. Stieg Larsson should take a bow for creating such a complex protagonist. She is the heroine of the trilogy, but her thoughts and emotions are still left hidden. It takes immense skill for that. Mikael Blomkvist plays the perfect second fiddle to her. Letting her make her choices and helping her as and when she needs it. This book takes the focus off his relationship with Berger, but he finds love soon in another woman. Is it Lisbeth? Lisbeth already had feelings for Blomkvist. Will she win him this time? Who killed Zala? How far would the Section go to hold on to its secrets? And why is Lisbeth Salander the target? Though all the books are translated from Swedish, it doesn't make you feel that. A very special mention to Reg Keeland who has done an impeccable job with the translation. The writing is clean and precise with great finesse. Stieg Larsson is a genius when it comes to story telling. It is not easy to write a series with two main protagonists with a single story line and have it span across three books and keep the plots connected. Harry Potter was brilliant, but it did have a new story with every book while the characters remained the same. This one has a continued plot that gets intriguing with every page. The stories are disturbing and yet makes you crave for more. I wouldn't call this a happy ending, but I'm happy the way it ended. The fourth novel in the series is out, but I'm not too sure if I would read it. Since it is written by another author, David Lagercrantz, I'm not too sure if it would have the Larsson touch. I did not like what Tilly Bagshawe did to Sidney Sheldon's name. For now, I'm happy with the trilogy and it is clearly the best series I have read so far. Verdict: Fantastic conclusion! An absolute must read if you have loved the first two. I'll definitely have to buy this trilogy now! Probably next year because I have to finish Harry Potter series and Infernal Devices trilogy before picking up any other series. I don't have enough stats to give this book and no amount of writing can justify how amazing this book is. I loved how everything ties up at the end. Even I was wondering about the fourth one since it's a different writer. I remember how the new writer ruined Hercule poirot for me. Well reviewed. Yeah right? Such a mind blowing story this. I'm no longer picking up books with continuation from new writers.